We had an order for a pop up birthday card with a fishing theme. The popup was of a silhouette of a fisherman fishing in his boat. This was laid against a slightly foggy sunset backdrop. The fisherman of course manages to catch a fish in time, just as the sun slowly set behind the rolling mountains. We kept the front of the card simple, to create an element of surprise when the card opens and the fisherman 'pops' out! ithink this is great i am making one for my dads birthday can u give my some ideas on how to make it? 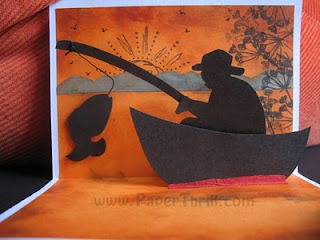 The backbone of this popup card is the box popup technique (there are lots of tutorials on this technique available online), while the other elements like the boat and fisherman is attached to the box.